Press releases on natural menopause relief and Rebekah Brooks and news stories on Cathie Black and a new Ambassador to Egypt appear to me to have only one thing in common: photos of women. Really? In 2011 it’s okay to lump together any mention of women into a related category? Obviously, the Daily Beast doesn’t care if the stories it suggests you click on are related. They are simply shoving more material at you in the hopes that you’ll see something — anything — you like and click. Perhaps their model includes getting money if you click on one of the “Paid Distribution” articles. I assumed that “paid distribution” meant that the writer published the story through PRWeb or other press release service, but maybe the payment to the Beast is more direct. Whatever the reason, the Daily Beast sure cheapens its brand in my opinion. Employing bad algorithms to trick your readers — whether by intention or by sloppy quality control — says bad things about you. If you cut corners in your content display, how about in your reporting? The memory-loss woman’s photo is particularly gruesome, IMHO! The “Related Stories” appeared at the bottom of a news article I found through Google news. The topic and headline of the master story that these women are supposedly related to: “Former Joint Chiefs Chairman Dies” on the passing of General John Shalikashvili. The blog directory 52XTAUWXSQA9 blog central site Technorati is periodically re-recommended in industry publications as a place you MUST sign up for. Their sign up process is cumbersome, and we haven’t seen any difference in traffic results based on our status. But, we’re trying it again. We’ll let you know when this blog is accepted and if we see any interesting traffic results. A client was puzzled because her business was tanking but it seemed like everyone was reading her blogs. She was getting a lot of comments encouraging her to keep up the good work and telling her how valuable her insights were. Why weren’t those happy readers calling her for her services? Sad to say, when I looked at her blog I discovered that it was mostly a spam magnet. She was getting phony comments from automated programs who were carefully linking back to their own site. Her blog was being used as a way to deceive Google into thinking that the spammers had a popular web site of their own. A comment mechanism that instructs Google not to follow links in comments. The first tool is essential. This blog uses a spam filter that catches 100’s of attempts by automated bots to link back to their site. 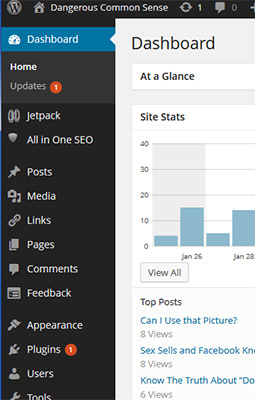 The second tool is now industry standard for blogging programs like WordPress. It makes your blog less attractive to smart spammers by robbing them of the Google boost IF any of their spammy comments should get through. This precaution may make you feel better should the anti-spam program slip up and allow a malicious comment to be published. However, it generally doesn’t lessen the amount of spam on your blog because most spammers use a shotgun approach and don’t investigate to see if their spam is really going to help them. Your blog can be helpful to your business and your reputation. Blogging is fun, too! However, practice safe blogging. It’ll help you collect realistic statistics, and by robbing spammers of their links you’ll be doing your part to fight slimy Internet practices. Want to hire me as an SEO expert to make your business show up high on SERPs? I’m asking if you want to use my Search Engine Optimization skills to get your web site to display at the top of the list of Google’s Search Engine Result Pages. I write and edit a lot of copy for clients, and about half of them send me material that starts off reading like a cryptographer’s training manual. My church seems particularly addicted to using arcane acronyms when publicizing its events. Invitations are written like: “Come to UUSF’s SCW luncheon in the MLK with PCD delegates.” Sounds like something you want to do, right? The addiction to alphabet soup acronyms and jargon isn’t always accidental. When I have replaced “UU’s welcome you…” with “Unitarian Universalists welcome you…” I have gotten told off by some of the original authors. “‘Unitarian Universalist’ is too wordy,” I have been instructed. Yes, “Unitarian Universalist” is indeed a mouthful. If the organization’s name is too long, then perhaps a catchier name should be adopted. But, announcement writers shouldn’t adopt in-group shorthand in their work. Non-Unitarian Universalists may not have a clue what a “UU” is. Once readers have been introduced to the full term, the abbreviation can be specified and used later on. “Unitarian Universalists (UUs) welcome you to the UU picnic.” Or, something more exciting, but along the same lines. Similarly, when I rewrite messages about services from professionals like lawyers and accountants, I am questioned if my straight-forward, non-jargon language sounds educated enough. It’s like a potential client won’t hire the firm if the attorney’s web site uses English sentences instead of Latin-infused contract terminology. Here’s the truth: visitors will click away from your web site if you speak to them in code. Unless you are the National Aeronautic and Space Administration, NASA-like acronyms make you sound cultish and not open to newcomers. And, using industry jargon — whether it is educated jargon or just simple convenient jargon — puts distance between you and your potential client. Remember who you are writing for and leave both abbreviations and in-terms out of your writing.